The Asus ZenBook Pro UX580GD is big and heavy, as is its AC adapter, and battery life isn't great. All of which means that this 15.6-inch laptop will spend most of its time deskbound. On the plus side, the screen is superb, and there's plenty of CPU and GPU power on offer. If you're in the market for a sturdy workstation-level laptop that can breeze through photo and video editing, you've met your perfect match in the ZenBook Pro 15. The ZenBook Pro can go toe-to-toe with the MacBook Pro when it comes to performance. And the much-hyped ScreenPad can actually be more useful than Apple’s TouchBar. Still, poor battery life holds the entire system back, and we wish the ScreenPad ecosystem was stronger at launch. 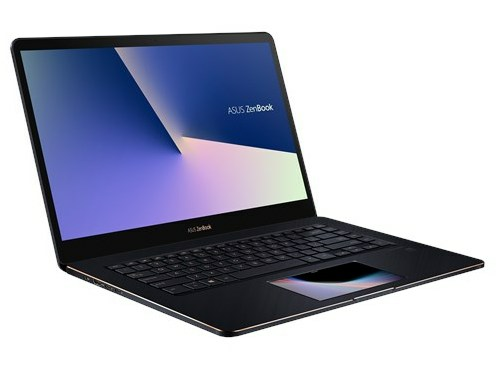 The ZenBook Pro 15 certainly looks like its big enough to accommodate a full-size SD card slot so it is puzzling why ASUS would decide to ditch it for a microSD card reader instead. This will likely inconvenience many photographers, a good number of whom still shoot with SD cards. The Asus ZenBook Pro is worth its weight in gold for power users who are into AV editing and gaming. Build, performance, display and audio quality are top notch on this model. Oh, and it has a touchpad that’s also a display. The Zenbook Pro’s dual-screen design may sound a little gimmicky, but from what I’ve seen it has a lot of potential, especially for power users and creatives. The second display not only looks great but is highly customisable, so if Asus can iron out the few performance niggles I experienced, I can see the second screen being a key selling point for both Zenbook Pro models. The ZenBook Pro 15 is likely to cost a lot of money but for those with the budget this could be a great MacBook Pro alternative and rival to the Dell XPS 15. Asus knows that it will grab headlines and eyeballs with the ScreenPad, but we fear that real-world use will prove to be a bit complicated. A secondary Users will especially struggle with when to use it like a touchscreen as opposed to a trackpad. A lot will also depend on software makers, and wide support is not guaranteed, considering that this isn't an industry standard. We'll have much more detail when we get to use and live with the new ZenBook Pro models over a longer period of time. If and when Asus launches them in India, we'll have a full, detailed review. ASUS’ new ZenBook Pro 14 and 15 have two screens each, and that’s not even due to some new-fangled design in the style of the company’s Project Precog concept PC. Instead, the 5.5-inch trackpads on the laptops serve double duty as touchscreen IPS displays, and they’re meant to improve your ability to multi-task. 1.88 kg: Normalmente subportátiles, ultrabooks y portátiles muy livianos con diagonales de pantalla de 12-16 pulgadas pesan así.